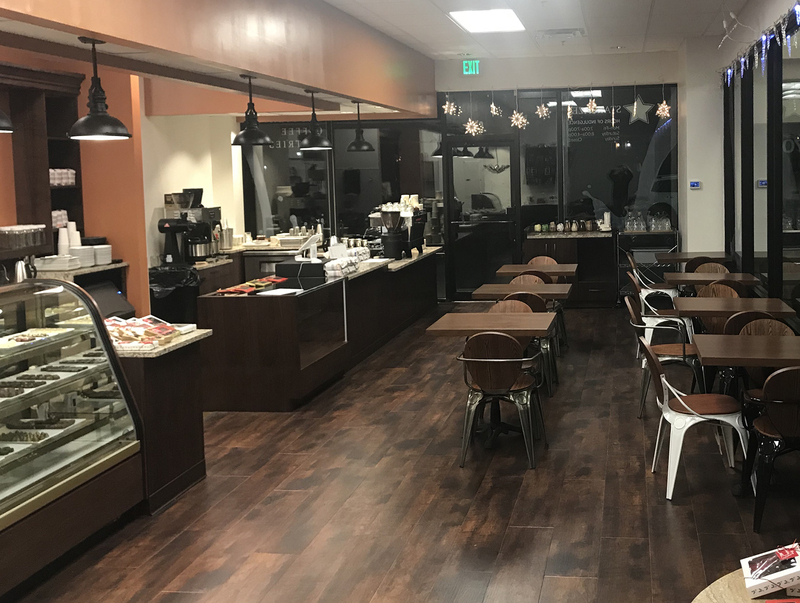 Please visit Stargazer Fine Chocolates & Coffee Shop at 700 Colorado Boulevard, east side, just south of Trader Joe’s in Denver. Open Mon-Fri 8 AM – 6 PM and Sat 8 AM – 4 PM. 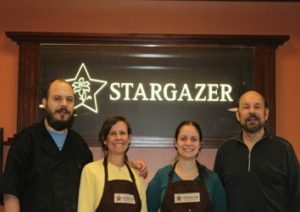 Stargazer Fine Chocolates recently opened at 700 Colorado Blvd. in the same building as Snooze and across a parking lot from Trader Joe’s. It’s very much a family affair. 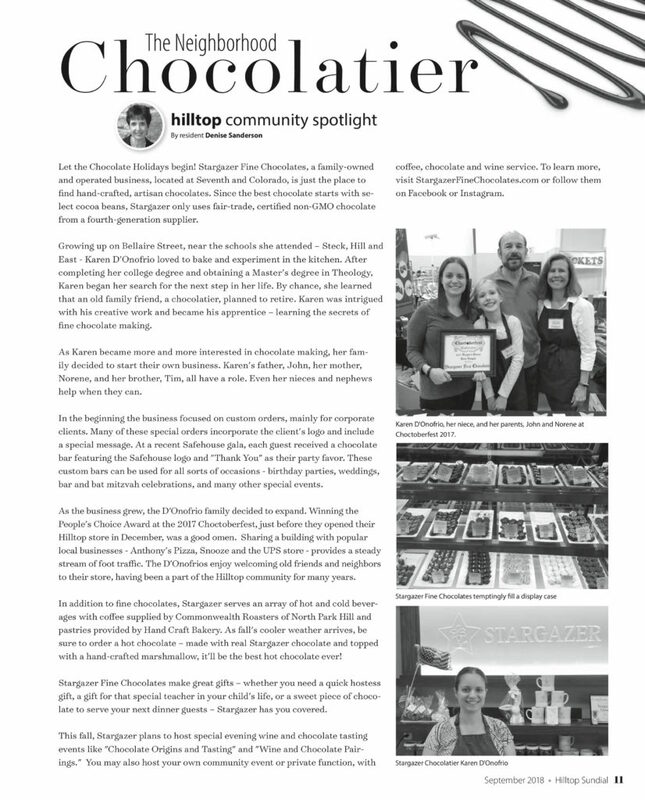 Daughter Karen D’Onofrio is a Master Chocolatier who trained at Ecole Chocolat. Dad John D’Onofrio is a lawyer, entrepreneur and salesman extraordinaire. Mom Norene oversees corporate orders and helps ensure things run smoothly and son Tim is the assistant chocolatier. 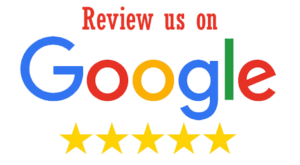 “I have never been happier working long hours at Stargazer with my two adult children. To work with your family is a true blessing,” said John D’Onofrio. 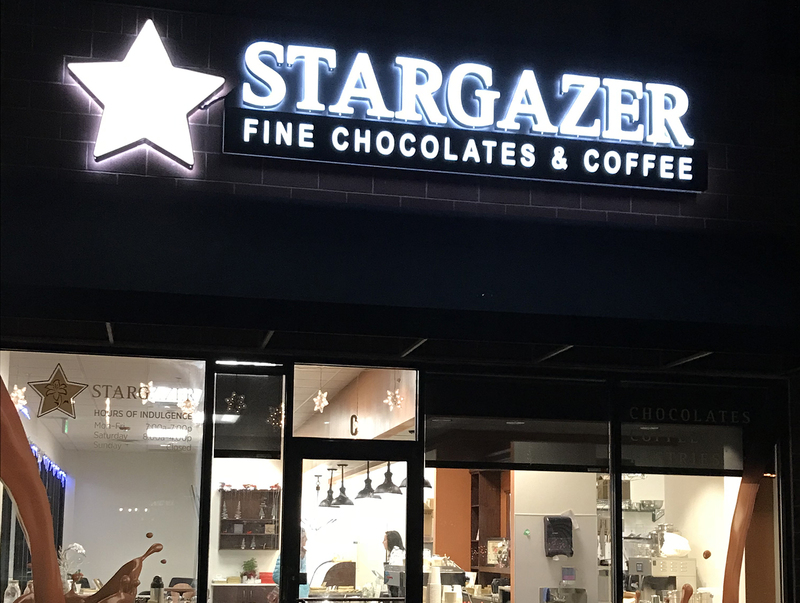 Chocolate, coffee and pastries are what’s on the menu at Stargazer. Karen has created 20 different truffle flavors, including peppermint eggnog and strawberry champagne. There are also solid chocolate bars and chocolate covered Oreos, grahams, pretzels and rice crispies. Seasonal items include heart-shaped boxes made out of chocolate and filled with truffles for Valentine’s Day. The family had a 25-year relationship with a local chocolate shop owner who trained in Europe. He shared his knowledge and expertise with Karen before his retirement. Stargazer started in the D’Onofrio dining room. 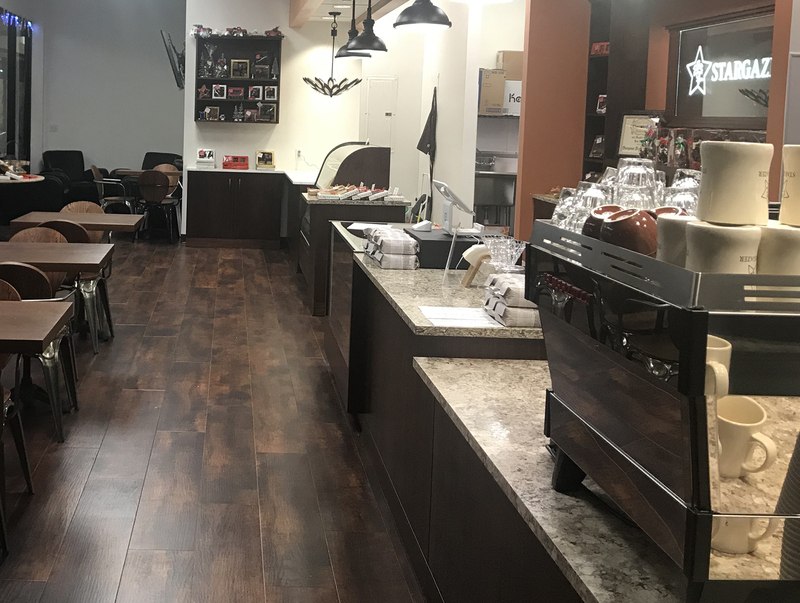 As the business grew, the family began renting commercial kitchen space at their church. The dream has always been to open a store. The company also sells corporate and custom gifts, and accepts online orders. The “hours of indulgence” at Stargazer are Monday-Friday 7:00a.m.-7:00p.m. and Saturday 8:00a.m.-4:00p.m. 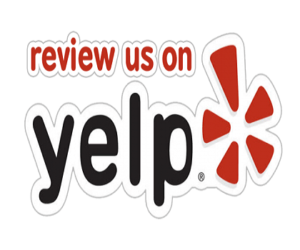 Visit stargazerfinechocolates.com.